Preschool series. Join Grace as she starts her first hobby. At an antiques shop Grace sees some gemstones and decides she would like to collect them as a hobby. Browse content similar to Hobby. Check below for episodes and series from the same categories and more! This is Grace and she's three years old. which sells interesting things from the olden days. Grace's mum collects old jewellery. Wow, Grace, look at this! Let's go and see what we can find. This is Grace's memory box. It helps her remember all the exciting things that have happened. See if you can remember what goes in it today. Grace, are you going to help me find some jewellery for my collection? Look, Grace, I think there's some jewellery here. -Tell me what you think of that? -I like that rainbow one. That looks nice, doesn't it, a nice ring? -and Grace helps Mum choose some jewellery. Look at all these. What might Mummy like? Have a look. What can you see? A bracelet. Where does that go? -Very nice. It suits you. Grace's mum decides to buy the bracelet. There are lots of different things to collect here. would you like a collection of your own? -Yeah? Let's go and see what we can find. I wonder what you're going to collect, Grace? Look, Grace, they're old milk bottles. Some people collect them. And, look, cars. You could collect cars. -What colours can you see? Grace, would you like to collect gemstones as your collection? Collecting gemstones sounds like a great hobby. A hobby is a regular activity that is done for enjoyment. as it depends on what you like to do. Grace has chosen to start collecting gemstones. and often used to make jewellery. doing an activity like painting or drawing, or playing a game or sport. but to get there, they have to travel in a cable car up a mountain. Wow, here's the cable car that's going to take us up the hill. Are we going to get in? They board the car, the big wheel turns the cable, and off they go! -It's because it's going faster. -Can you see a river? And the cars on the road here. Look, Grace, more cable cars! As we're going up, they're coming down. -Finally, they arrive at the top and get out of the cable car. The first thing in Grace's memory box is a cable car. -Hey, guys, welcome. I'm Gemma. Put these on. -We're going to keep you safe round the cave. -We'll take you underground and show you some rocks. Hang on to the railings. Come on, nice and steady. -It is a bit wet. The cave goes down inside the mountain. Oh, wow, Grace, we're going deeper and deeper into the cave. -I wonder what we'll find. -I wonder if we can see gemstones. -I wonder if we can. Yes, all this rock around us. -Look at that big rock up there, Grace. What do you think that rock looks like? Do you think it looks like a crocodile? Can you see the crocodile shape in the rock? His big nose and his eye sticking out up there. It eats rocks?! That's funny. -Shall we go and see the rest, guys? Grace, it's slippy. Be careful, darling. -What do you reckon to that? -Look how big that chamber is. -Wow! That's a big cave, isn't it? Can you see all the shiny crystals in the rocks? The ranger shows Grace where gems are formed in the rock. Can you hear that noise, Grace? What does it sound like, Grace? -Sounds like water dripping in. Can you see the shiny bits in the roof? -It is sparkles, it's gold! It's not real gold. It's fool's gold. Iron pyrite. It gets the name because you can use it to light fires. they climb up some steep steps and on to the misty hillside. You can see a long way from the top of a hill. Look how far we are. I can see a castle there. The second thing to go into the memory box is a cave. which sells the gems dug from underground. What's all these, all these precious stones? They're all the colours in the rainbow. Would you like a bag and put some in here for your collection at home? -Which ones would you like? -They're lovely, these, aren't they? What beautiful colours for your collection. I think your bag is full now. -Shall we have a look over there? Oh, look, Grace, I can see fool's gold. Did we see that in the cave? It is. Look how many colours. And, look, they've used some to make bracelets. They pay for their gems and head off to look for more stones outside. The third thing to go into the memory box is some gemstones. to pick up a few stones for her collection. -Wow, Grace, look at all them big rocks over there. -Oh, yeah. Shall we go and see what we can see? Grace has a look around and finds some interesting stones. -Let's go and find some more. -What a great place to explore. Look, Grace, that is definitely a stone for your collection. -Oh, I love that blue one there. OK, I think we're done now. Let's go. so people can try panning safely. -Do you fancy panning for some gemstones? It looks like there's only sand in there. We need to wash the sand away. Can you do it on your own? -Can you see the colours starting to appear? I can see the gemstones. -That's a final one for your collection. -Grace, gemstone collection's looking really good. -Grace takes her gemstones home. people used to pan rivers for gold and other precious gemstones. and used for making jewellery, such as rings and necklaces. Mum and Grace are in the garden and Mum has an idea. -Do you know how we've been collecting our gemstones? I've got an idea. You know how Mummy likes collecting jewellery? Would you like to make some with the gemstones that you've collected? -Yeah? That's a nice hobby, isn't it? Grace sorts out the stones and Mum glues on a bead. I've done a rainbow, Mummy. Oh, yeah, you've made a rainbow with all your gems. That's beautiful. OK, Grace, we're going to make our necklace now. Can you pick the first gemstone? Shall we try it on you? Oh, look! It's made a necklace. The fourth thing into the memory box is a necklace. Today, Grace began her first hobby. Let's have a look in the memory box. First, Grace went up a mountain in a cable-car. Next she visited a cave to see where gemstones come from. Then she went on a gemstone hunt. Finally, she made a necklace. Today, Grace started her first hobby. Join Grace as she starts her first hobby. Grace's mum collects jewellery, and they go to an antiques shop to see what they can find. Grace sees some gemstones and decides she would like to collect them as a hobby. Mum then takes Grace to a large cave to find out where gemstones come from. 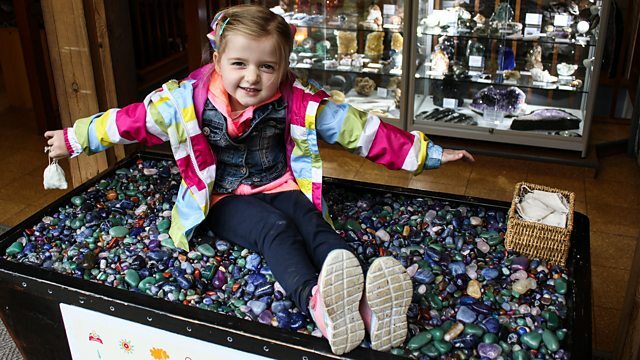 They then go to a shop that sells gemstones so Grace can build her collection. Grace and Mum then go on a gemstone hunt before going home to make jewellery out of her collected stones.